This is one of the finest surviving examples of a mid 16th-century guild flagon. The three cast shields on the body, engraved with an ox's head, a lion holding an axe and a trophy of meat cleavers, indicate that this was the flagon of a butchers' guild. The body is decorated with plaques after the celebrated German sculptor, medallist, cabinetmaker, woodcutter and designer, Peter Flotner. Guild flagons are some of the most monumental items of pewter ever commissioned. Large tankards like this one served in drinking rituals during guild ceremonies. They also acted as display centrepieces for the table. Large tankards were heavy enough when empty but once filled could not possibly be handed around. They were known as 'Schliefkanne' - literally, 'a pot that had to be dragged'. Smaller cups were passed around formally, starting with the Master of the Guild, with each participant sipping from the cup and proposing a toast. The guilds controlled almost every aspect of their trades, from purchasing raw materials and prescribing hours of work to ensuring quality of production and regulating the lives of the workers in their professions. Pewter is an alloy or mixture of metals consisting primarily of tin. Adding metals such as copper and antimony makes pewter harder and more durable. The best alloys contain over 90% tin. Before 1800 lead was allowed in ‘lay metal’, a lower-quality alloy used for measures and boxes. Pewter’s low melting point makes it suitable for casting, though early casting moulds were expensive. Soft lead made casting easier, but was poisonous, so it was forbidden in ‘flatware’ such as plates, dishes and porringers which came into contact with food. Pewter’s softness makes it ideal for engraving. Tankard of a Butchers' Guild. 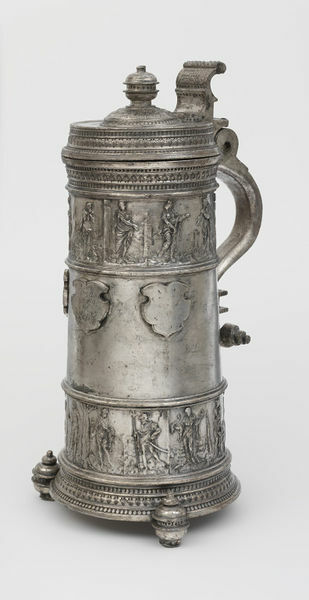 The pewter tankard has a cylindrical body which tapers upwards and incorporates two horizontal bands of cast ornament representing the Sun, Moon and planets (Jupiter, Mercury, Saturn, Venus and Mars), seven Muses (Terpsichore, Erato, Calliope, Euterpe, Clio, Urania and Polyhymnia), seven Virtues and two Deadly Sins. The plain, central band on the body has three cast shields lined horizontally and engraved: the central one shows a lion holding an axe; the left shield shows an ox's head; the right shield shows a trophy of meat cleavers (the latter two shields partly erased). Two 'linen marks' inside the body show where the handle was cast directly onto the body: cold damp linen pressed on the inside while the mould containing the molten pewter for the handle was applied to the outside, prevented the hot pewter from burning through the body. The handle depicts a figure of Lucretia above a mask which is in turn above another figure (now rubbed) standing in an archway. The top of the handle includes a five-ringed hinge to hold the lid. The lid has a large thumbpiece, a band of ornament and a 'spool' finial. The tankard sits on three feet cast in the same moulds as the finial. The top and bottom of the body, the rim of the lid and the thumbpiece are decorated with bands of punched leaves, crosses and figure 'I's. Much of the tankard has the remains of silver plating. The figurative ornament is based on cast plaquettes by the Nuremberg artist Peter Flötner (d. 1546). Vertical seams on the bands of ornament show that they were cast in separate moulds and bent around the body to form complete bands. On the upper face of the handle: maker's touch, P over W in a shield, for Paulus Weise (around 1535 - d. 1591), town mark 'Z' in a shield, struck either side of the maker's touch, for Zittau, in Saxony, eastern Germany. Three cast shields lined horizontally on the body are engraved with an ox's head (left), a lion holding an axe (centre) and a trophy of meat cleavers (right) suggesting the the tankard was made for a butcher's guild. The engraving of the ox's head and the meat cleavers have been deliberately rubbed and scratched away. Only traces of the ox's horns and muzzle are visible; only traces of the cleaver handles and blades are visible. 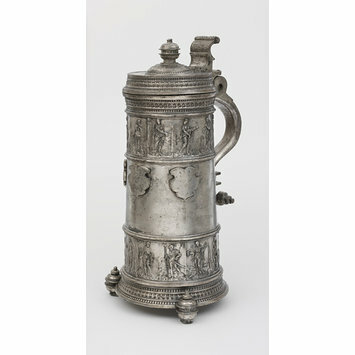 The tankard was one of the Museum's early purchases, bought in 1853 for £12. It may be seen as one of those objects which heralded a change in direction in the Museum's collecting activities after the appointment of John Charles Robinson as Curator in 1853. Robinson was a prolific collector and persuaded the Museum's first director, Henry Cole, that historic works of art were as instructive to students as 'modern manufactures'. Under Robinson's guidance, some of the earliest purchases by the Museum included outstanding examples of European pewter. Historical significance: This is one of the finest examples of a mid 16th-century guild flagon to survive. A similar tankard by the same maker, Paulus Weise, is in the Stadtmuseum, Zittau (the town in wich this was made). Both examples are decorated with plaques after the celebrated German sculptor, medallist, cabinetmaker, woodcutter and designer, Peter Flotner. Some of the more monumental items in the V&A's pewter collection are the flagons of trade guilds. The guilds controlled almost every aspect of their trades, from purchasing raw materials and prescribing hours of work to ensuring quality of production and regulating the lives of the workers in their professions. Large tankards like this one served in drinking rituals during guild ceremonies. They also acted as display centrepieces for the table. Large tankards were heavy enough when empty but once filled could not possibly be handed around. They were known as 'Schliefkanne' - literally, 'a pot that had to be dragged'. Smaller cups were passed around formally, starting with the Master of the Guild, with each participant sipping from the cup and proposing a toast. Pewter’s low melting point makes it suitable for casting, though early casting moulds were expensive. Soft lead made casting easier, but was poisonous, so it was forbidden in ‘flatware’ such as plates, dishes and porringers. Pewter’s softness makes it ideal for engraving. Brett, Vanessa, Phaidon Guide to Pewter, Phaidon, Oxford, p.71, ill.
North, Anthony, The Pewter Gallery and Victoria and Albert Museum, in The Journal of the Pewter Society, Vol. 12, No.1, spring 1999, p36, ill.